Here's the first "Silent" TV spot for A THOUSAND WORDS. The comedy is directed by Brian Robbins and stars Eddie Murphy, Clark Duke, Kerry Washington, Justina Machado, Cliff Curtis, John Witherspoon and Jack McBrayer. Look for it in theaters on March 9th. 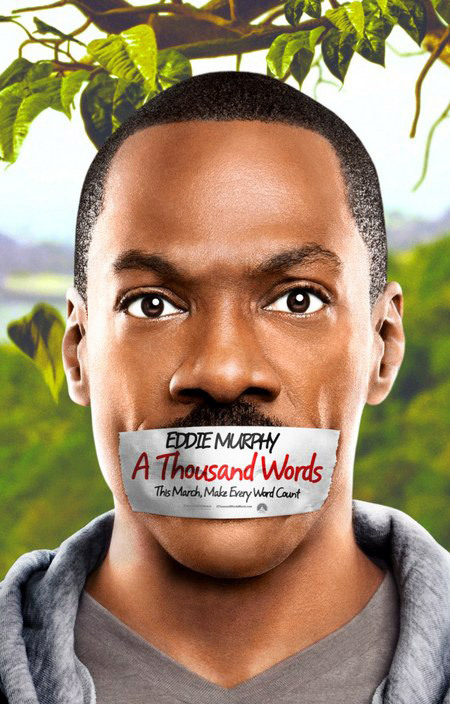 Fast-talking agent JACK's (Eddie Murphy) insincere patter is his chief weapon, but it irritates his assistant AARON (Clark Duke), threatens his marriage to CAROLINE (Kerry Washington) and gets him into trouble repping guru/author DR. SINJA (Cliff Curtis). Jack suffers karmic repercussions from Sinja's magical Bodhi tree, which sheds one leaf for each word Jack speaks. After one thousand words, Jack will die.